Samsung will launch a new entry into its flagship Galaxy Note series this summer. The new productivity-focused handset will likely borrow a number of the new design features introduced with the Galaxy S10e, Galaxy S10 and Galaxy S10 Plus earlier this year, as well as building upon the Galaxy Note 9 unveiled last year. Ahead of the launch, which will land sometime in August provided that Samsung sticks with its typical release schedule, YouTube channel DBS Designing has published a gorgeous video that reveals what the Galaxy Note 10 could look like. The handset in the concept video tallies with a number of the whispers we've already heard about the next-generation Galaxy Note. Most sources seemingly agree that the Galaxy Note 10 will follow in the footsteps of the Galaxy S10 5G, tipped to launch in the coming months, and include a quadruple rear-mounted camera. This will likely include the same array of cameras – a 12MP wide-angle camera with Optical Image Stabilisation (OIS) and a dual aperture that changes based on the amount of available light, coupled with a 16MP ultra-wide angle, a 12MP telephoto camera, and a hQVGA 3D-depth sensing camera. The latter, which equates to 0.038-megapixels, will enable adjustable artificial bokeh-style blur behind the subject in real-time when shooting video. While a number of flagship handsets already offer Portrait Mode-esque photos, this is the first time we’ve seen the same effect applied to video. The new depth-sensing camera will also enable new Augmented Reality (AR) modes and effects in the future, Samsung has promised. It's possible that Samsung might tweak this set-up for the Galaxy Note 10 following the response to the launch of the Galaxy S10 5G, or to enable new productivity-focused features that will appeal specifically to Galaxy Note users. Samsung might attempt to ape the 5x lossless optical zoom that we've seen from rivals like Huawei. It recently bought Israeli company Corephotonics, which is an expert in the field. Elsewhere, we expect to see an Infinity-O style display with dual front-facing cameras, and an in-screen ultrasonic fingerprint scanner. 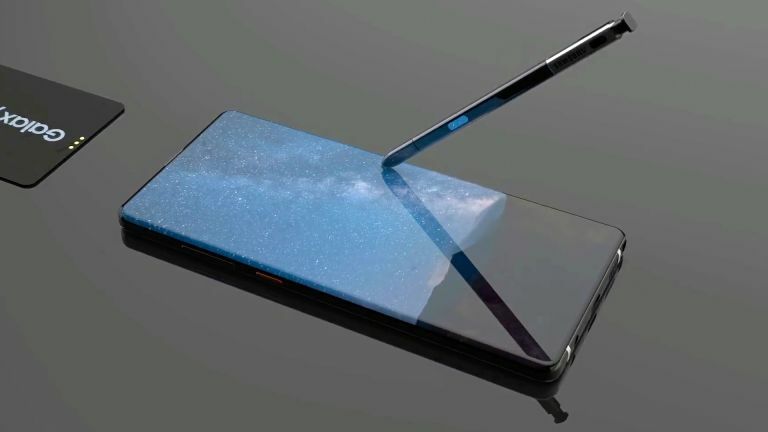 YouTube creator DBS Designing has imagined the Galaxy Note 10 shipping with a next-generation Infinity-O display without the need for a visible cut-out in the screen. Samsung has already talked about the possibility of embedding its cameras beneath the screen so that it doesn't interrupt the AMOLED display. However, it seems very unlikely this will be ready in-time for the Galaxy Note 10. Inside, we're likely to get a serious bump in specs – with the Qualcomm Snapdragon 855 or the Samsung-built Exynos 9820 likely to be aboard the Note 10 for super-fast processing, video editing, and better battery life. However, it's possible that a new Exynos chipset will be available in time to power the Galaxy Note 10. The Exynos 9825, rumoured to launch later this year could give the handset even more of a boost in performance and battery life, as well as 5G network capabilities.